Fistfights broke out Friday around Najaf's most sacred shrine a day after U.S. troops refused to intervene when gunmen loyal to a radical cleric ransacked an Iraqi police station there. Coalition forces came under fire in another Shiite city south of Baghdad. 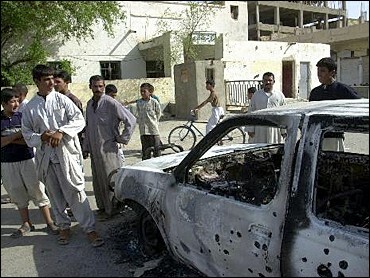 In the capital, a car bomb exploded Friday on a highway in the Sayediya district as a U.S. patrol passed nearby. Two U.S. Humvees were slightly damaged but there was no U.S. confirmation of any casualties. The trouble in Najaf started Friday morning when hundreds of protesters marched toward the Imam Ali Shrine to express support for a peace plan which was threatened by clashes the day before. Supporters of radical cleric Muqtada al-Sadr blocked their way and fights broke out between the two groups. The shrine was evacuated and its doors closed as a security precaution, witnesses said. An American soldier died of wounds suffered in an ambush in eastern Baghdad. Four other soldiers were wounded in the Wednesday night attack. More than 820 U.S. service members have died since the Iraq conflict began March 2003. Assailants fired rocket-propelled grenades Thursday night at coalition troops near the Shiite city of Hillah, about 60 miles south of Baghdad. Polish officials said there were no casualties and the attackers fled when troops returned fire. President Bush says it's unrealistic to expect that NATO will send more troops to Iraq, but he still is branding this week's Group of Eight summit a success. Despite memos from administration lawyers saying he might be exempt from laws against torture, Mr. Bush on Thursday said, "Anything we did would conform to US law and would consistent with international treaty obligations." But he refused to say if torture was ever justified, CBS News White House Correspondent Mark Knoller reports. The U.S.-led coalition's top leaders ordered an investigation Friday into whether archaeological sites around the ancient city of Babylon had been damaged during the expansion of a military camp. The South Korean government said it would send 3,600 troops to a Kurdish area of northern Iraq late August despite pressure to reconsider the long-delayed deployment. South Korea, which already has 600 military medics and engineers in the southern Iraqi city of Nasiriyah, had planned to send its troops to the ethnically contested city of Kirkuk in April. The plan was canceled because of fears the troops might be caught up in fighting. An Italian aid worker claimed in comments reported Friday that a ransom was paid for three Italian hostages in Iraq released earlier this week, adding to uncertainty over how the men were liberated. The Italian government denies paying a ransom, and coalition forces said the men were liberated in a bloodless raid. Despite the scuffles between marches and militiamen, Najaf was generally quiet Friday following gunbattles in which al-Sadr's fighters seized and ransacked a police station. Hospital officials said six Iraqis were killed and 29 wounded, including eight children. It was the first outbreak in fighting in Najaf since a truce mediated by Shiite clerics and politicians ended eight weeks of clashes between U.S. troops and al-Sadr's al-Mahdi Army militia. Al-Mahdi Army fighters remained in their positions around the city's main mosque Friday, inspecting cars and checking identification papers. But there was no sign of weapons. U.S. troops refused to intervene because the fighting was too close to Shiite shrines and because it was unclear whether al-Sadr was trying to subvert the truce. Al-Sadr aides said the fighting broke out when relatives of a man killed by police sought revenge. Maj. Gen. Martin Dempsey told CNN it was too early to tell whether the truce, mediated last week by Shiite clerics and politicians to end nearly eight weeks of fighting, had collapsed. But the U.S.-appointed governor of Najaf province, Adnan al-Zurufi, warned that if the violence continued "there won't be a truce." He gave the militia 24 hours to clear armed men off the streets. Al-Sadr's spokesman, Qais Al-Khazali, warned the governor against "following the Americans" or sending forces near the holy shrines "because this could lead to fighting." American forces are trying to lower their profile in Iraq and hand over more responsibility. Dempsey, commander of the 1st Armored Division, said that Iraqi police, who deserted when al-Sadr's rebellion began in April, fought well Thursday despite losing control of a station. Lt. Gen. Thomas F. Metz, who took command of the new Multinational Corps Iraq headquarters last month, said Thursday the military was changing its focus from fighting guerrillas to training Iraqi troops and protecting the fragile interim government. Nevertheless, American soldiers clashed Thursday with other militants loyal to al-Sadr in Baghdad's Sadr City neighborhood, a Shiite district named after al-Sadr's father, a cleric murdered by the Saddam Hussein regime. At least one militant was shot and killed by a U.S. tank as he prepared to fire a rocket-propelled grenade at the Americans. Knots of young, black-clad militiamen fired machine guns, small arms and rocket-propelled grenades at American positions, while U.S. Army Apache helicopters roamed the skies seeking targets. A flock of terrified sheep scampered down one street past Shiite gunmen. A roadside bomb exploded Thursday evening in Sadr City near a convoy of sport utility vehicles favored by Westerners in Iraq. There was no official conformation of casualties, but pools of blood could be seen around a wrecked vehicle.